Where’s the weight machine for THAT? I grew up snowboarding, waterskiing, and knee-boarding. Despite being fairly athletic, and in shape during those years, I would always have those horrendous first days of each season, where my muscles felt like they had JUST been discovered for the first time EVER. I could have snowboarded my heart out all winter long, dropped my snowboard and hopped directly on the knee-board, and would not be able to walk or reach a box of cereal from the cupboard for the next three days. No matter what, you simply use a completely different set of muscles for each sport. I discovered this weekend, that this also apparently applies to (although I wouldn’t really call it a sport…) spray painting. Yes, I said spray painting. I started a small project I’ve been thinking about for a while. I’m doing a photo collage in the hallway, with some of my daughters drawings turned into photos, mixed in with some cute pics of her, all in white frames. 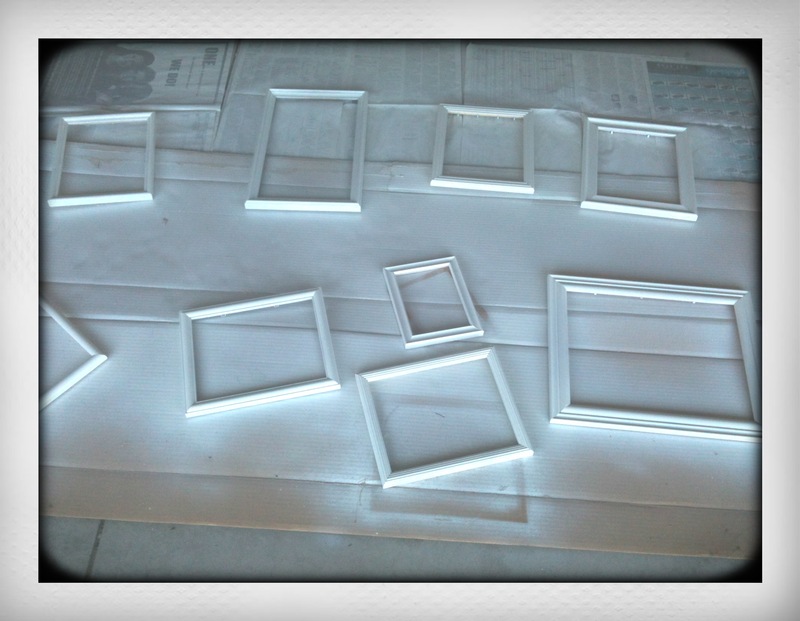 So I took a bunch of old plain and painted wooden frames, dismantled them, and began to spray them. I’m not a “seasoned” spray painter, but I figured I should start with primer. Right? Sure. About ten minutes into it, the can stopped spraying. The directions say it’s an “any angle” spray can. They lied. I tried all the tricks suggested to see if it was clogged, to no avail. So, I decided to scrap the primer idea and go straight for the painting, (By the way….I am not a real patient person, probably something you should know). I did two coats. I don’t know how long it took exactly to do the spraying, but they turned out great! The next day, I was fine, but the 2nd day….ohmygoodness…my hamstrings (the muscle that runs the length of the back of your thigh) were tighter than a gnats arse! And my thumb and pointer finger were aching like you would not believe. Really? From SPRAY PAINTING? Clearly, I need to focus on a couple different muscle groups the gym. Point me in the direction of the hand muscle machine please? Haha. I’ll show you the collage when It’s done (after I complete physical therapy….only kidding). For now, here is my first batch….